Lots of fiction readers are dealing with a problem that booksellers face on a regular basis: how to read a book that is talked about constantly? I've heard from several customers that they can't read the Franzen book right now. There's simply been too much chatter from lovers/haters. It is difficult to read something without hearing all the voices--which is the biggest reason I've never read "The Kite Runner" or "The Lovely Bones" or "The Elegance of the Hedgehog". It isn't snobbery. I've simply heard too much about all of them to read them fairly. All of that is really just prologue to my actual point. 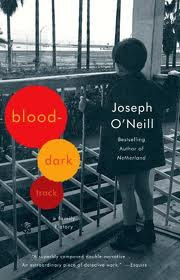 Which is that I was thrilled when I got into the store today and saw Joseph O'Neill's "Blood-Dark Track" sitting on the paperback table. O'Neill is the author of the much ballyhooed novel "Netherland". President Obama loved it, every major book review loved it, your book club probably loved it. Me? I thought it was fine. Maybe it was the cricket. Maybe not. I kept waiting and waiting for that aha moment and it never came. Had I heard it was brilliant too many times? However, his earlier memoir about his two grandfathers is the real deal. It is brilliant. I love it. Love it so much, in fact, that I paid way more than I normally do for any book to get a hardcover copy when it was out of print. 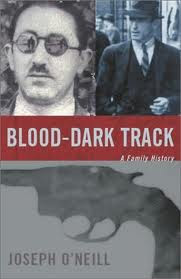 Both of his grandfathers, one Irish and one Turkish, were imprisoned during WWII for suspected subversion. On the one hand it is a great family history. And on the other it's a great look at two different cultures during world war. I am so pleased to be able to sell this book. And if you want "Netherland" that's great too. Want another skip the famous book but read the previous one? Elizabeth Gilbert, pre-insane fame, wrote a fantastic book entitled "The Last American Man". That book is a joy. Final thanks must go to local book wizard Jay Peterson, of Magers and Quinn, for obtaining the out-of-print book for me. The cover with the young boy is the newer one, fyi.